• Firms with an investor base composed primarily of individuals typically should have paid lower dividends than do firms with investor bases predominantly made up of tax-exempt institutions. 8 Elton, E.J. and M.J. Gruber, 1970, Marginal Stockholder Rates and the Clientele Effect, Review of Economics and Statistics, v52, 68-74. 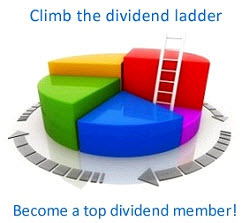 • The higher the income level (and hence the tax rates) of the investors holding stock in a firm, the lower the dividend paid out by the firm. • As the tax disadvantage associated with dividends increased, the aggregate amount paid in dividends should have decreased. Conversely, if the tax disadvantage associated with dividends decreased, the aggregate amount paid in dividends should have increased. The tax law changes of 2003 have clearly changed the terms of this debate. By reducing the tax rate on dividends, they have clearly made dividends more attractive at least to individual investors than they were prior to the change. We would expect companies to pay more dividends in response. While it is still early to test out this hypothesis, there is some evidence that companies are changing dividend policy in response to the tax law change. 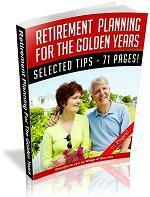 Technology companies like Microsoft that have never paid dividends before have initiated dividends. In figure 10.11, we look at the percent of S&P 500 companies that pay dividends by year and the dividends paid as a percent of the market capitalization of these companies from 1960 to 2003. 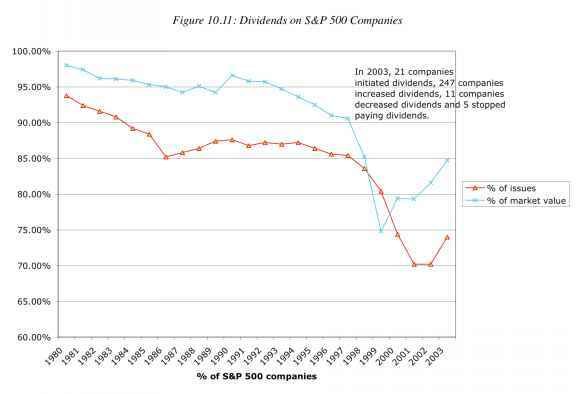 There was an up tick in both the number of companies paying dividends in 2003 and the dividends paid, reversing a long decline in both statistics. It will be interesting to see whether this continues into the future. In Practice: Dividend Policy for the next decade As firms shift towards higher dividends, they may be put at risk because of volatile earnings. There are two ways in which they can alleviate the problem. • One is to shift to a policy of residual dividends, where dividends paid are a function of the earnings in the year rather than a function of dividends last year. Note that the sticky dividend phenomenon in the US, where companies are reluctant to change their dollar dividends, is not a universal one. In countries like Brazil, companies target dividend payout ratios rather than dollar dividends and there is no reason why US companies cannot adopt a similar practice. A firm that targets a constant dividend payout ratio will pay more dividends when its earnings are high and less when its earnings are low, and the signaling effect of lower dividends will be mitigated if the payout policy is clearly stated up front. • The other is to adopt a policy of regular dividends that will be based upon sustainable and predictable earnings and to supplement these with special dividends when earnings are high. In this form, the special dividends will take the place of stock buybacks. In summary, you can expect both more dividends from companies and more creative dividend policies, if the dividend tax law stands. British Petroleum provided a preview of innovations to come by announcing that they would supplement their regular dividends with any extra cashflows generated if the oil price stayed above $ 30 a barrel, thus creating dividends that are tied more closely to their cashflows.